Most chaffing dishes use Sterno™ (small cans of flammable gel, known as ‘canned heat’). 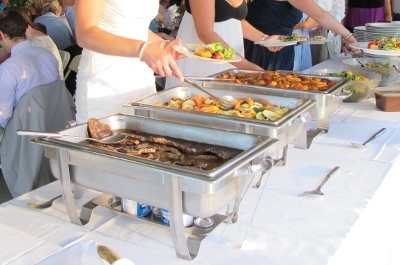 Before placing a Sterno™ beneath the chafer, be sure to put a sufficient amount of hot water in the bottom of the pan. A shortly before the food arrives, take the caps off the cans of Sterno™ and light them while they are beneath the pan. For safety, be sure there are no flammable decorations in the area of the Sterno™ cans. 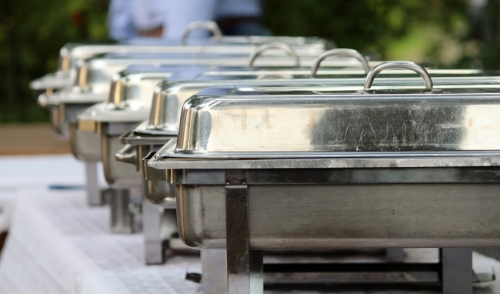 Chafers are equipped with a secondary pan that the food should go in. This pan seat inside of the existing chafing pan, suspended above the water. As long as the the top lid is covering the food pan, it will keep the food warm while the cans of Sterno™ are burning. Of course, the pans that hold the food will require the most cleaning, but be sure to wipe down the entire chaffing dish (frame, bottom pan and lid). Before moving the chaffer, ensure that the Sterno™ is not lit. Simply putting the lid over the can will snuff out the flame. Using a potholder, lift out the bottom pan and dump out excess water.